ADOPT or FOSTER a loving pet Today! Revolution Rescue is a all volunteer, foster-based rescue out of Lincoln, Nebraska and is a 501(c)3 non-profit group. A project that started years ago and officially launched in 2015, Revolution Rescue is an all breed dog and cat rescue that focuses on giving shelter pets a second chance. Many times, lost or surrendered animals that end up in unfamiliar surroundings find themselves terrified, withdrawn, and even aggressive, while their normal temperament would be the complete opposite otherwise. These are the ones that are often overlooked by potential adopters and unnecessarily euthanized in the shelter systems. By working with local Humane Societies and shelters, Revolution Rescue is able to acquire these pets and place them in loving foster homes until their forever homes are found, which gives them a chance to shine and ultimately, saves their lives. Please consider adopting a companion animal today. After all...rescue is the best breed. Want to adopt but can't commit? Fostering is a great solution! Do you love animals? We're always looking for help--become a volunteer! JOIN US FOR THIS SUPER FUN EVENT...IT'S COMING UP QUICK! WOW! 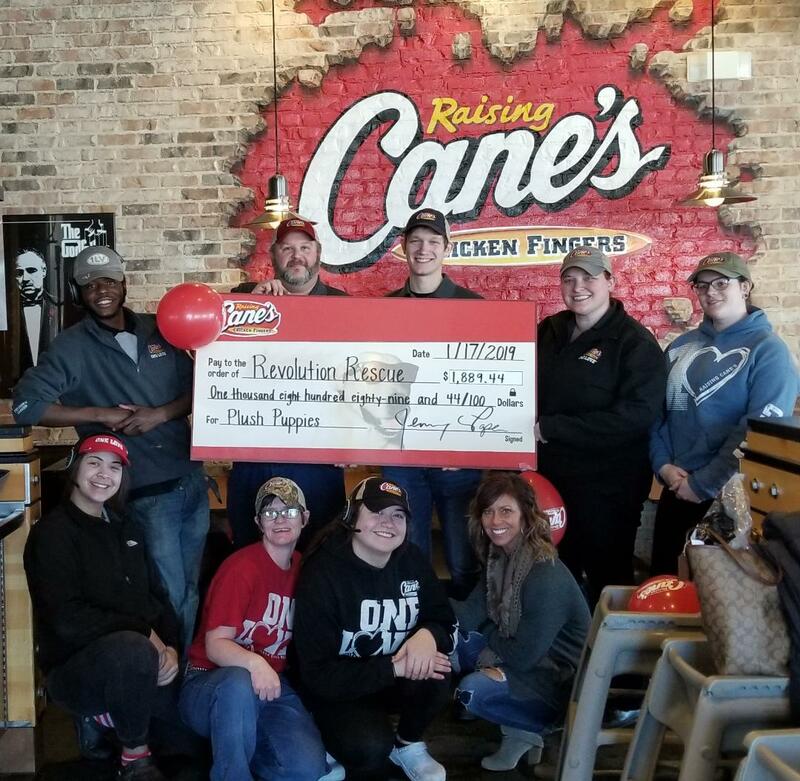 We are blown away by the generosity we received from everyone who participated in the Raising Cane's Chicken Fingers Plush Puppies and Calendar fundraiser! Between the 4 Lincoln stores, there were 528 Plush Puppies and 452 calendars sold--that is an amazing amount of support for Revolution and the animals in our care! Thank you to Cane's for choosing us as the recipient and thank you to ALL who believe that rescue matters...we couldn't fulfill our mission without you. *If you'd like to see your business advertised here and help a great cause at the same time, contact us and we'll have details on how you can donate (ie: be a sponsor) and become a part of the Revolution! Quotes you'll LIKE and your animal(s) will LOVE. “Folks will know how large your soul is by the way you treat a dog”. “Animals DO have a voice. If you ignore their suffering, I will remind you of it. If you don’t understand them, I will translate. If you don’t hear them, I will be their voice. You may silence them, but you cannot silence me as long as I live”. "There is no fundamental difference between man and animals in their ability to feel pleasure and pain, happiness, and misery". * Approximately 7.6 million companion animals enter animal shelters nationwide every year. Of approximately 3.9 million are dogs and 3.4 million are cats. * Each year, approximately 2.7 million animals are euthanized (1.2 million dogs and 1.4 million cats). * Approximately 2.7 million shelter animals are adopted each year (1.4 million dogs and 1.3 million cats). * Of the dogs entering shelters, approximately 35% are adopted, 31% are euthanized and 26% of dogs who came in as strays are returned to their owner. * Of the cats entering shelters, approximately 37% are adopted, 41% are euthanized, and less than 5% of cats who came in as strays are returned to their owners. * The majority of pets are obtained from acquaintances and family members. 28% of dogs are purchased from breeders, and 29% of cats and dogs are adopted from shelters and rescues. * According to the American Humane Association, the most common reasons why people relinquish or give away their dogs is because their place of residence does not allow pets (29%), not enough time, divorce/death and behavior issues (10% each). The most common reasons for cats are that they were not allowed in the residence (21%) and allergies (11%). * It is impossible to determine how many stray dogs and cats live in the United States; estimates for cats alone range up to 70 million. * Owned cats and dogs generally live longer, healthier lives than strays. * Many strays are lost pets who were not kept properly indoors or provided with identification. * Only 10% of the animals received by shelters have been spayed or neutered, while 83% of pet dogs and 91% of pet cats are spayed or neutered. * The cost of spaying or neutering a pet is less than the cost of raising puppies or kittens for a year. Statistic sources include ASPCA, HSUS, and American Humane Association.